Boston, MA – Empire Loan, the “one stop money shop” for Greater Boston and Providence, Rhode Island consumers, has a solution to help local area federal workers survive the historic government shutdown. Today Empire Loan announced that they are offering no interest, no fee loans to qualified furloughed employees. This past Friday, roughly 800,000 federal employees missed their first paycheck. About 380,000 employees have been furloughed and another 420,000 are currently working without pay. Congress has already passed a bill that guarantees all federal employees will receive back pay once the shutdown is over, but that does little to help them while it drags into its fourth week. An Empire loan uses a customer’s personal property as collateral instead of their credit. What individuals can borrow is based on the value of the item they bring in to Empire Loan for appraisal. For example, jewelry, coins, electronics, musical instruments and tools can all be used as collateral for a loan. Based on the value of that item, Empire Loan will lend furloughed federal employees cash on the spot with no fees, no interest, no credit check, paperwork or spiraling debt. Once they are back to work – no matter how long it takes for the government shut down to end – furloughed employees can pay back the interest free loan and get their collateral back without compounding interest or lingering debt. The second shutdown of the United States federal government in 2018 – which has continued into January 2019 – began at midnight EST on Saturday, December 22nd, making it the longest U.S. government shutdown in which federal workers have been furloughed in history. The shutdown occurred when the United States Congress and President Donald Trump could not agree on an appropriations bill to fund the operations of the federal government for the 2019 fiscal year, or a temporary continuing resolution that would extend the deadline for passing a bill. The Antideficiency Act prohibits federal departments or agencies from conducting non-essential operations without appropriations legislation in place. As a result, nine executive departments with around 800,000 employees had to shut down partially or in full, affecting about one-fourth of government activities. First established in 1985 by Michael Goldstein, Empire Loan is New England’s leading pawn shop with 8 locations in Boston, Providence, New Bedford, Worcester, Stoughton, Lowell and Lynn. Empire Loan is more than just a pawn shop, it’s a local, community-focused business that strives to change the image of pawn shops. Empire Loan enthusiastically supports the communities where they operate, providing donations to organizations like the Boys & Girls Club, Girls Inc., Health Centers, and local Arts & Entertainment organizations. In 2011, Goldstein created the Empire Loan Charitable Foundation which supports a wide range of programs in the communities where Empire Loan operates. Pawn Shops are regulated by local, state and federal laws pertaining to loans, purchases and privacy issues. People often think when their property is stolen they simply go to a pawn shop and see if their merchandise is on display there, but it’s really not that simple. Here’s a description of the process and what you should do if your merchandise is stolen. First, understand that Pawnbrokers and other second hand dealers are generally required to report all transactions they make to local police or authorities. In addition to pawn shops, jewelers and consignment shops that buy gold and silver jewelry and other items are all required to maintain records of transactions and report them to local authorities on a regular basis. This often includes providing pictures and descriptions of all the items they take in, along with a copy of the ID and photos of the person who brought the item in. The pawn shop must then hold the item for a specific period of time, usually a minimum of 30 days, to allow the police time to investigate if the merchandise was part of a crime. Fairly recently New England law enforcement agencies have centralized this information through NESPIN, New England State Police Information Network, where all six New England states (Connecticut, Maine, Massachusetts, New Hampshire, Rhode Island and Vermont) share the information of what has been brought into pawn shops and second hand dealers across the region, allowing local law enforcement the opportunity to search database to see if items brought in were the result of a crime. This database is not available to the public but is accessible to local law enforcement. Call the police. The first step after you discover a theft is to contact the local police where the crime was committed. Police will be able to take the information and conduct an investigation to try and locate your items. They may have knowledge of other crimes in the area and will also be able to review the records kept by other local police departments in surrounding communities to try and locate your items. As mentioned earlier, they can now also review the NESPIN records for all of New England to try and track your merchandise. If they are able to identify any possible items, they will then contact the pawn shop or second hand dealer themselves to verify if they are yours. If you do find the item, either in police records or on display in a pawn shop or jewelry store, contact the police department where you filed your original report. Only they can request the records of the pawn shop’s transactions. Because of privacy laws, pawn shops are not allowed to give out any information on any customers they have done business with. At Empire Loan, even though we would like to help you recover your merchandise, we are not allowed to tell you how we may have obtained a particular item. Empire Loan will however provide that information to the police or state authorities. Since 1985, Empire Loan has worked effectively with local law enforcement to help people recover their stolen merchandise and we pride ourselves on being cooperative with the authorities. Contacting local pawn shops directly yourself: Pawn shops do not want to buy or lend money on stolen merchandise. In the end, pawn shops can be the only ones who lose if it turns out they have taken in stolen merchandise. If the merchandise you lost was unique, if you have pictures of it or serial numbers, in the case of electronics, that can help the pawn shop identify the item. Unfortunately it’s not always possible for pawn shops to track details about every item that comes in the door. 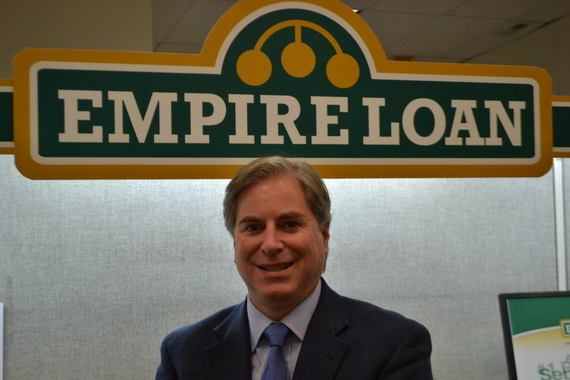 Empire Loan has 8 stores and does hundreds of transactions in a typical day. This means if you lost a gold wedding band, it would be virtually impossible for us to tell you if somebody came in with one since we could have literally taken in dozens. Checking in a pawn shops display cases won’t always be very effective. First, as indicated earlier, pawn shops like Empire Loan hold onto merchandise for a minimum of 30 days before doing anything with it. If the item was stolen last week, it would be another 3 weeks before we’d be allowed to sell it. After the 30 days we may melt the item down if it’s gold or silver or sell it online or to a wholesaler if its electronics or a musical instrument. That’s why it’s important to work with the police in trying to locate your items in a timely fashion. Contact your insurance company. If you have a homeowners policy or renters insurance you may be able to file a claim. While this won’t result in getting your original merchandise back, you may be able to recoup some money to help try and replace the items. 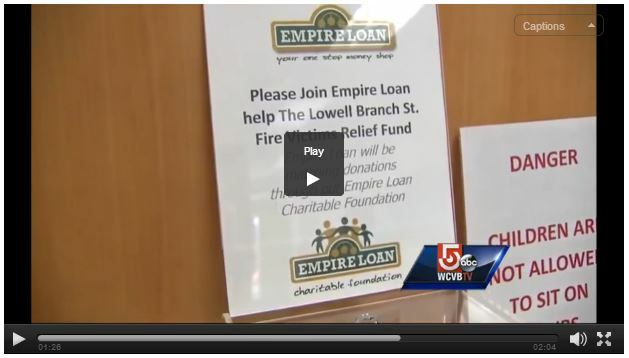 Empire Loan in Providence is all about giving back to the community. With two locations in the city, Empire Loan has made commitments to the North Main Street neighborhood where in addition to a beautiful pawn shop we have built Empire Guitars, a true home spun guitar shop. But on Broad Street in Providence is where Empire Loan has made a commitment to the community unlike any other pawn shop. 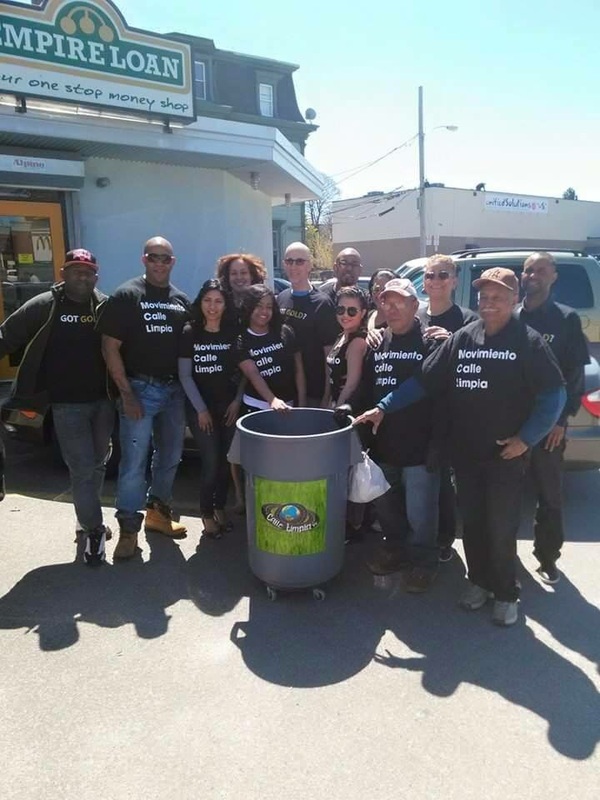 Through a partnership with Calle Limpia, a joint venture between Empire Loan and Mi Sueno and Acua, located on the other end of Broad St. these two businessmen have committed time, money and resources into cleaning up the street. Now in its second year, Empire Loan came up with 4 branded trash barrels on wheels with the logo for Calle Limpia on the side. That literally translates to clean street, something everybody can appreciate. The new Dennis Lehane book, World Gone By, features two characters named after charitable donors. Michael Goldstein, the CEO of Empire loan, gave enough money to charity to be featured in Lehane’s new book. Rather than asking Lehane to use his name, however, Goldstein chose a mention for his wife, Allison Picott. A Read more about the book and charitable contributions here. Moving the Right Pawn — Building Empires Interview With Michael Goldstein. Via Huffington Post. What does it take to build a massive empire from scratch? You are about to find out! I recently had a sit down with entrepreneur extraordinaire Michael Goldstein. 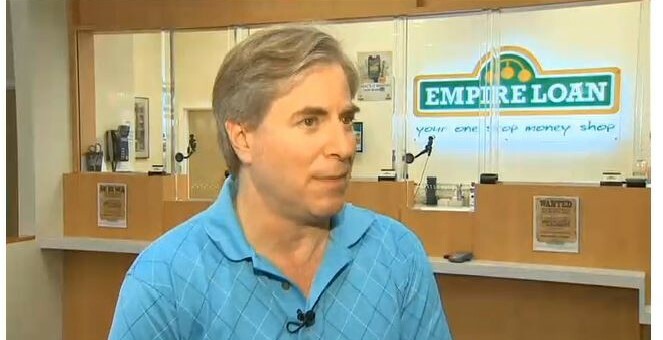 Michael has systematically built his business, Empire Loan, over the past 30 years, and today it is, by far, the most successful pawn brokerage in New England. Michael is a third generation pawn broker, having learned the trade from his dad and his grandfather, while working at their family pawn shop in the Bronx, New York. Today, Empire Loan, a company founded by Michael, has 8 stores (plus one store that specifically sells guitars) and 50 employees, and generates $9M a year in revenue. Building a successful empire is much like winning at chess, it takes strategy, experience, and the ability to consistently move the right pawn. Here are 4 lessons to building a massive empire, one pawn at a time. As with many small companies the communities they serve are incredibly important, often the lifeblood of their business. When we saw our neighbors at Building Bridges Through Music were the victims of a tragic robbery, leaving the charity ransacked and out thousands of dollars of equipment, we knew we had to help. With the children in mind, we sprung into action donating 7 guitars, a laptop, an amplifier, and a check for $500. We were inspired by the devastated looks on the children’s faces, and more determined then ever to empower them and the community. We are proud to stand with Doreen Murray of Building Bridges Through Music and the community of Lynn and hope our generosity inspires others. LOWELL, Mass. —Lowell residents are stepping up to help those affected by a devastating fire on Thursday that killed four adults and three children. The tragedy has touched off a donating frenzy across the community. The Wish Project in Lowell has collected five tons of donations in two days. Michael Goldstein, the CEO of Empire Loan in Lowell, said the company will donate $1,000 and will match donations dollar for dollar up to $2,500. You can catch the full article from WCVB. A process that took Empire Loan all of an hour to execute required several months of back-and-forth planning between the Boston-based pawnbroker and the Lowell Historic Commission. But it all came to fruition on Tuesday morning. “It” represents the installment of what Empire Loan owner Michael Goldstein refers to as the “universal symbol of pawnshops,” three gold hanging spheres from a bar. 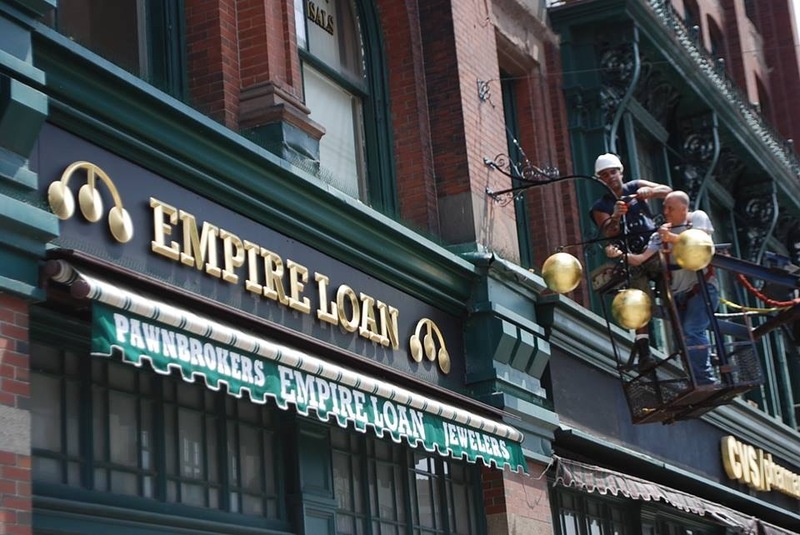 Beginning shortly before 10 a.m. Tuesday, workers from CO Graphics & Sings of Stoughton hoisted the symbol and attached it to the facade at Empire Loan’s shop on 43 Merrimack St. For the entire article you can–> read more here. For all those people who have wondered whether the painting they found in the attic is a masterpiece, or if the guitar that was buried in the back of the closet is worth anything, CashCam is the app that can help answer the question. 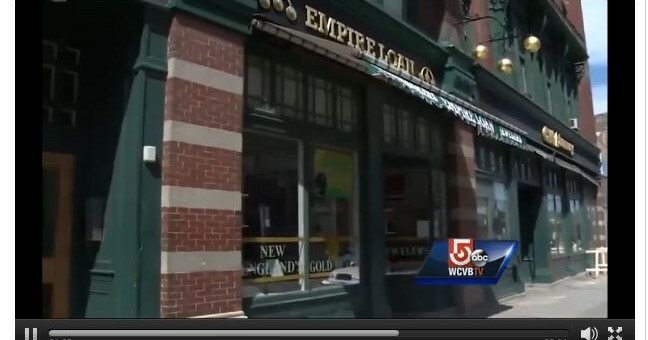 Empire Loan, a New England chain of pawn shops around since 1985, has developed an app that will allow you to take a picture of an item and send it off to get a quick assessment of whatever it is you might come across from their staff of experts. CashCam was the brainchild of Empire Loan Founder and CEO Michael Goldstein. “People come into our stores or call us up all the time wondering if what they have is treasure or trash. With people cleaning out attics and basements, going to flea markets and yard sales, everybody is trying to find the next great discovery.” Goldstein went on to say “with TV Shows like Antiques Roadshow, Pawn Stars and American Pickers, people have gotten curious about what things are worth. CashCam is designed to help them figure out what they may have”. 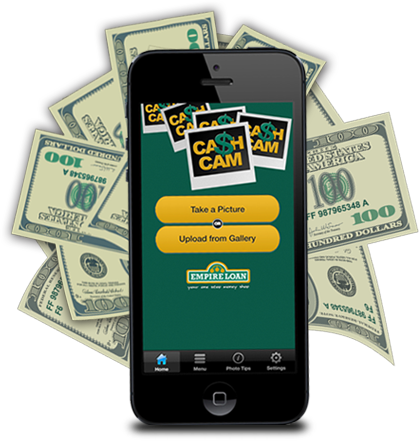 CashCam is a free app available in the ITunes App Store and Google Play Store and lets the user take a picture of an item or upload one from their smart phone’s gallery and send it off to the staff at Empire Loan to be reviewed for potential value as a resale or pawn item. Empire Loan can buy a customer’s item outright or give them a cash loan based on a percentage of its value. Either way, users can get an idea of the value of what it is they’ve come across. Treasure or trash. Cash or clunker. Empire Loan’s Cash Cam app can answer the question for you.